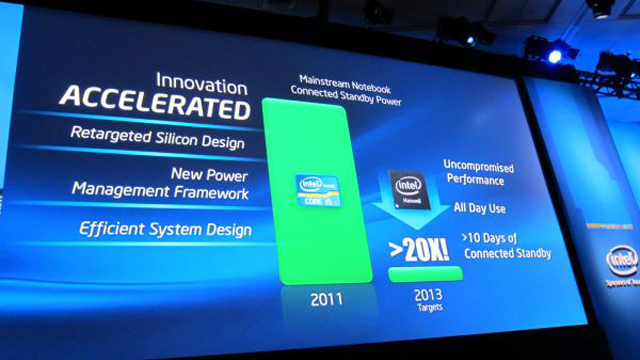 Today Intel changed the future of Apple MAC Books by announcing its new Haswell architecture chips. Intel announced its Chip on “Intel Developer’s Forum.” The update which will be implemented in 2013 to the new MAC Books will allow users to get their battery time increased to 24 hours. This 22-nanometer 3D-transistor architecture consumes so little power—20 times less than their current gear—that it can run on a solar cell. That’s exactly what they demonstrated at the Intel’s Developer Forum today: a Haswell-based Windows computer running entirely off a solar cell that was being exposed to a light bulb. This will be a pretty impressive Technology ported to MAC Books in upcoming Years. We will be getting 10 days of Battery stand by time. That’s really good. This is a really intelligent and efficient move by Intel.